Good morning fellow scrappers & bloggers. It's reveal time over at Sketchabilities! Today's sketch contained multiple pictures. Something that I haven't done in some time. Let's just say that I'm a little rusty! I started, stopped & restarted this page several times until I was finally happy with the end result. This page is about my husband. He's a country boy born & bred. Whenever I take him into NYC he always & I mean ALWAYS looks lost. Typical tourist look! He's always looking up at the sky scrapers--carrying his little backpack & in Times Square (which is where these pics were taken) he literally bumps into every other person milling around the place. It's as if he loses his gravity & sense of direction in the city! On one of our trips into NYC this past summer, I finally took pics of him as he looked around Times Square in awe for about the 100th time. Being that it's a page based on my hubby--I leaned more towards a grungy look. When I plan on being grungy/masculine I always go for my Tim Holtz goodies. So about 90% of this page is Tim Holtz. Here's the fab sketch by Karan. As I already mentioned I especially enjoyed this one since it made me use multiple pics/elements. A closeup of the masking, distressing, layering & some of the small squares. 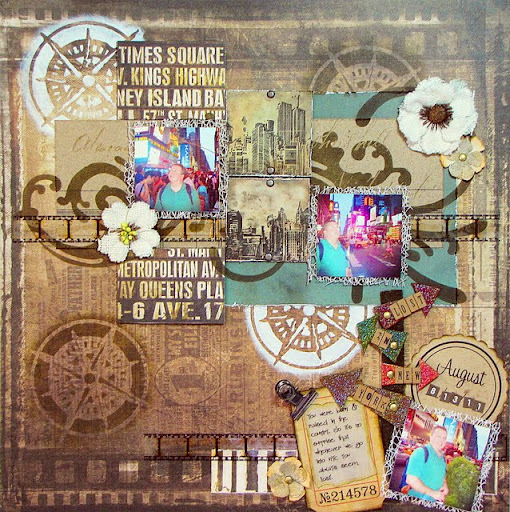 I stamped an image of New York on two of the four squares & added two brads to further decorate them. For the flourish--I used the negative part of Tim Holtz's flourish mask along with Walnut Stain distress ink. The title is an embellishment made by me. I created the sign post out of arrows from Tim Holtz's grunge board elements & the post itself I cut out from grunge chipboard & then embossed it with the tree bark embossing folder by Tim Holtz titled Alterations . I then inked the arrows with a couple of distress inks in shades of red, green & brown. Finally I heat embossed the arrows with clear Kaleidoscope embossing powder by Stampendous. I finished up my sign post by adding the title with tiny alpha-letter stickers from my stash. This is one of the two masked compasses. I used white acrylic paint for the masking. The compass mask itself is also by Tim Holtz. Finally I used a journaling ticket by Tim Holtz to add a few sentences about my husbands usual behavior in NYC. A big thanks to all of you who take the time to visit my blog & to comment. Your comments are always very much appreciated! 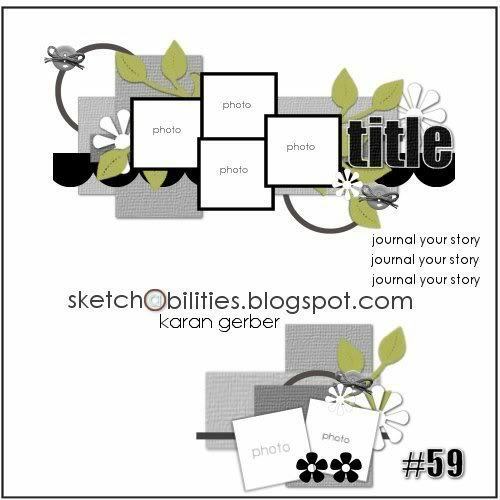 Please do drop by the Sketchabilities blog to play along & to check out the other talented DT's interpretation of sketch # 59. Very cool layout of your husband in NYC....I love all the little elements that are New York City and getting lost. Several of my family members have gone ...and I think you just gave me an idea of how to scrap their photos of their trip for Christmas:) The sign has got to be my favorite! It's genius! Hi Kay!! I love your page is Fabulous!! love the different techniques, textures and dimension here. when I visited NY I'm always looking to the sky,too...lol!!! love your take of the sketch...Beautiful work! Great masking on the patterned background. Love the arrows! great layout ! love all the details ! Love the "grunge" look and need to try it myself more often! I love the look on your husband's face...New York brings that look out for lots of folks! Fabulous! I love the arrows!! Absolutely GORGEOUS, Kay! As always, your creativity amazes and inspires me! This is gorgeous! Masking is lovely! Hola Kay! vi tu post en facebook y capto mi atencion, realmente se ve fantastico!me encanta tu atencion a los detalles! , yo creo que hace mas de un ano que no visitaba un blog !!!! Espero estes bien! Abrazos!